It is nautical home decor lamp with wooden adjustable tripod stand. . I had come across the symbol of laughter as “Laughing Buddha. And hence it came out as a table lamp spreading the light of happiness. by molding without a single tool. 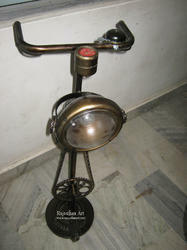 It can be used as a corner lamp , floor lamp as its height is of 20 height and 18.width. We hold expertise in manufacturing, supplying and exporting a superior quality range of Corner Lamp. Manufactured using quality-approved material, these lamps are widely demanded in automobile industries. Our customers can avail these products from us in various sizes, designs and shapes at most competitive prices. Beautiful wooden corner lamp.Coated with wooden shade mica at front.Which matches with your indore furnitures. Simple to hang at corners.Bulk order accepted. A fun, charming and practicle miniature table lamp to meet your basic lighting needs. A great choice for living rooms, bedroom, kids room or offices. 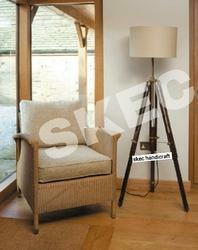 100% bamboo chic chatai floor lamp. Use as a corner lamp. Ecofriendly design, works on just 5 watt CFL energy saving lamp. Corner Lamp Dimensions : 5.5"l x 14'h.